The crescendo of xenophobic violence gripping South Africa has rattled the collective conscience of South Africans, now finding their voice in Madiba’s own views on intolerance. In 1993, Mandela had warned against the growing dangers and risks of not tolerating diversity. The simmering reality of xenophobia less than 18 months since the passing away of the icon serves as a stark reminder that words and warnings may have faded away if not his memory. 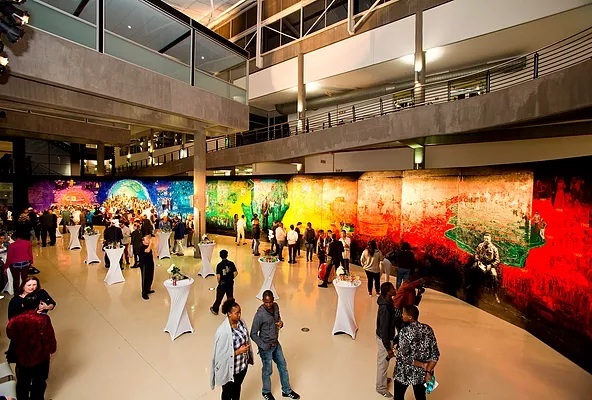 Artist Li Bin’s “A Tribute To Mandela” which was on display at the University of Johannesburg, South Africa, recently was a fitting and a sobering reminder of Madiba’s teachings. Hong Kong listed Shanghai Zendai, currently involved in the Modderfontein New City project north east of Johannesburg, South Africa, has brought Li Bin’s gigantic panoramic artwork to local shores. 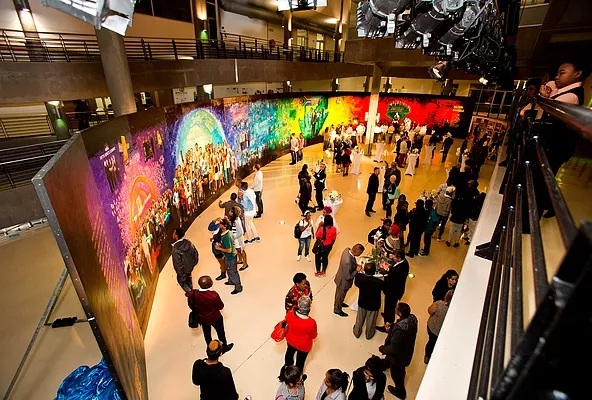 The University of Johannesburg and its Confucius Institute hosted the exhibition at the University’s Faculty of Art, Design and Architecture (FADA) Atrium. Artist Li Bin took two years to create the 38 metre by 3.8 metre masterpiece. Before coming to South Africa, the painting was exhibited in Beijing, Hong Kong and Taiwan. The exhibition was opened to the public and visitors were be able to catch a glimpse of a unique vision presented by Li Bin that is rich in historical context and emotional content. The Zendai Group and its local subsidiary, Zendai Development South Africa is proud to be associated with the painting and serve as co-sponsor for the launch. Bin’s work was informed by the vision articulated through photographs and research during his visit to South Africa in 2013 where he met Mandela’s grandson Mandla Mandela. 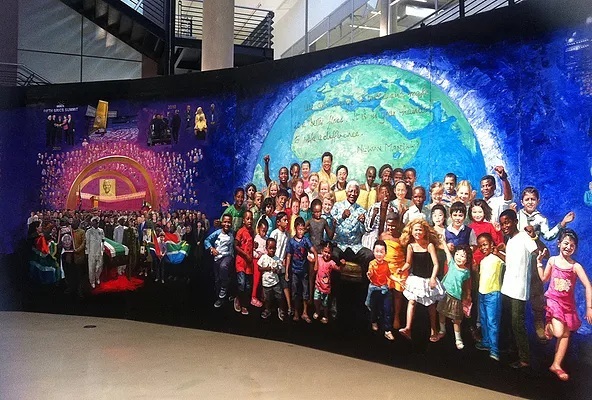 While he never had the opportunity to meet Mandela in person, he took Mandela’s philosophy on a visual journey – from a torturous past to a hope for the future – hoping to encourage the swathes of people playing an audience to his work to start writing their own story – for a better tomorrow for everybody. He painstakingly studied historical documents while composing the painting with a counter clockwise chromatic pattern of a rainbow serving as a backdrop. Bin’s understanding of the turmoil of the struggle era is visible in the canvas and largely influences the way he has allowed the narrative to unfold. Shanghai Zendai Chairman, Mr Dai Zhikang brought the painting to the attention of Mr. Thabo Thage, South Africa’s Consul General in Shanghai, when Mandela passed away. The painting was installed at the mourning site for Mandela in Shanghai at Mr Thage’s request. 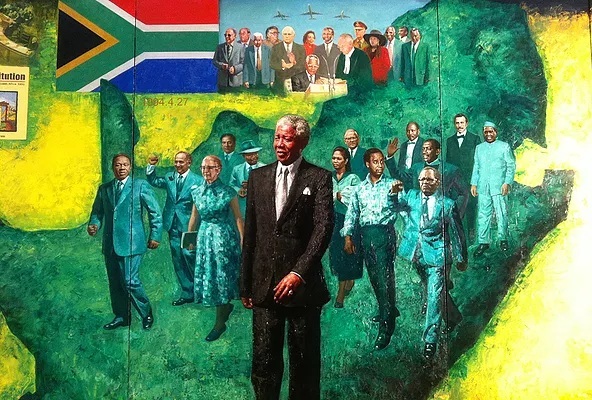 “In the lead up to Freedom Day in South Africa and on the occasion of the opening of this epic painting by artist Li Bin,” the Zendai Group would like to reiterate our commitment to South Africa,” he concluded. “I would like to thank all those who made this artwork possible and accessible to all South Africans. I’d encourage people to come and share in this vision and to take what you can from this humble attempt to paint an impossible picture of true grit, determination and sacrifice,” he concluded. Born in Zimbabwe and living in South Africa, Miriro is a seasoned publishing editor and writer, having worked with leading brands in investment, business leadership and entrepreneurship. Passionate about Africa’s development, Miriro is also a dynamic marketing consultant with 10 years experience working with startups and large multinational corporations. With a heart for travel, Miriro spends her time discovering the nooks of crannies of Africa’s hidden gems, taking the roads less travelled, meeting the beautiful people and enjoying their food and culture. She enjoys tackling complex strategic challenges in the passion-to-entrepreneurship pipeline, particularly focused on the implications of 4th Industrial Revolution and workforce automation on Africa's travel and tourism industry. Miriro is currently the Managing Editor of Nomad Africa magazine. Subscribe to Nomad Africa and never miss out on travel and tourism updates across the continent of Africa. Is Zimbabwe Pricing Itself Out Of Business? Experience a Four day tour of the beautiful country of Botswana. Nomad Africa celebrates life on the African continent. Covering stories from all countries and all cultures, it strives to include unique tourist attractions, business development, technology and investment opportunities as well as looking at the continent's cultural heritage. Please send all press releases to editor@nomadafricamag.com. © 2019 All Rights Reserved 2414 Publishing (Pty) Ltd. Designed by CreativeMagicGroup.